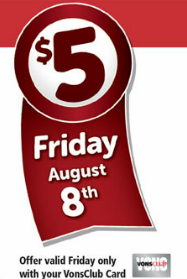 It’s $5 Friday at Vons today (8/26)! All the $5 deals are now exclusively available on Just 4 U. That means they must be loaded to your card in order for you to take advantage of the sale. We also have a 2x Gas Rewards coupon for the weekend that you can click or clip. Go here to sign in and load your card. 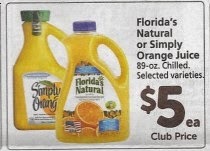 We’ve got a NEW printable coupon for $1.00/1 Simply Orange Juice 59oz. or 89oz. which will pair nicely with this Friday’s Vons sale. Just4U, SavingStar or uPromise here! Just 4 U. This program also has personalized pricing on items, so you want to check for those also as they could be better than the sale price for you depending on your past purchases. Here’s a good FREEBIE at Vons. 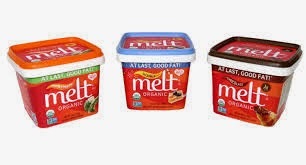 Just purchase 1 Melt Spread, use our $2 off printable and submit for an Ibotta rebate and you’ll get this for FREE! Vons – Nature Valley Bars Just $0.47! Sign Up HERE for Pillsbury online and ger FREE recipes and coupons!!! For example – this coming Friday, 8/28 – you can use this $0.60/1 printable coupon on Nature Valley bars found on the Pillsbury website and get them for just $0.47! Final price, as low as $2.35 for 5 or $0.47 each! If the deal lists $5/5 or 3 for $5 that doesn’t mean you have to purchase that quantity. You will get them for $1 or $1.67 respectively – the cost of whatever 1 item is. Typically there are no limits on the amount you can purchase, except for those that are stated on the ad. Check your Just4U account – sometimes you may have a personalized price that will beat out the $5 deal. Also, some deals may just be listed there and those are sometimes good for all weekend long.